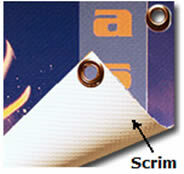 Scrim900 is an economic, high-quality, 15-mil, brightwhite, scrim vinyl banner. It has scratch and waterproof matte coating, and a tear-resistant polyester fabric that is sandwiched between two layers of white vinyl. This universal product is compatible with thermal and piezo inkjet printers, dye or pigment inks. Click the button below to add the Scrim Vinyl 42 inch banner 15 mil, 42" X 40' 1 Roll to your wish list.